There is no question that the students at TIS have huge hearts. 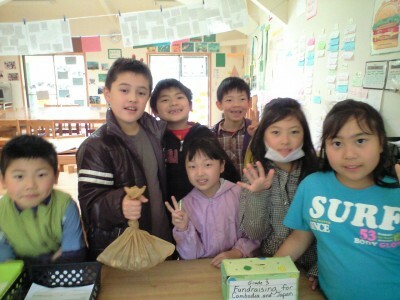 This week, the Grade 3 students have been collecting money and brainstorming ways to raise funds for the Tsunami relief effort. Not only this, but through their unit on Public Health, they have been in correspondence with the Cambodian Children’s Fund staff in Cambodia to start both a pen-pal program and, to raise some money for them too! Their efforts have been impressive indeed. All week students brought in their personal money to donate towards both causes. Of note was Tyler Drummond. As you can see in the picture, Tyler arrived at school with a huge bag of change. In fact, it was the entire contents of his piggy bank! Tyler’s father wrote and said, “We were a bit surprised to see him hacking away at his piggy bank when we all came down for breakfast this morning. We certainly hope it helps people who are worse off than ourselves and it looks like Tyler is learning the meaning of the expression ‘it is better to give than to receive’ “. Tyler donated about 4000 yen in coins! Collectively, the students gathered 11,971 yen. I should note that this was done by only seven students. The Grade 3 students should be proud of themselves for their continued compassion and empathy towards others. We have a very committed and caring group of grade 3s at our school. Today, the Grade 3 students also decided that their next fundraising endeavor would be to create a calendar featuring student art and all the reasons why they love Japan. When we brainstormed our ideas, the students came up with over 100 reasons why they love Japan. The calendar will be sold both locally and online as a tsunami-relief fundraiser. Please look forward to seeing their hard work in print. Please consider buying one! All the teachers are very proud of the Grade 3 class. Keep up the great work team!